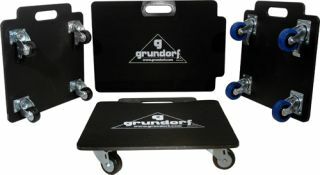 Grundorf has announced the addition of three new utility transport dollies to help audio pros move their equipment easier. Each of the three available models is manufactured from 13-ply Baltic Birch wood. Baltic Birch is an extremely rigid and durable material selected for its ability to support considerable weight without flexing. To prevent abrasions to the dolly’s edges, the wood has been finished with rounded edges for protection against damage and splintering. A carry handle is an integral part of the dolly’s wood platform. Being carved directly from the dolly’s wood base, the handle has no protrusions to catch on clothing or other items. The dollies are designed to stand on their side when not in use. The surface side of the dolly plate is carpeted, ensuring a scratch-free environment that won’t harm the equipment’s exterior. They are equipped with two brakes that enable them to remain stationary on an incline. The new Grundorf utility transport dollies are available in two plate sizes: small (20.75 x 20.75 inches), and large (29.75 x 20.75 inches). The small model is outfitted with a choice of heavy-duty 3-inch or 4-inch casters while the large dolly employs heavy-duty 4-inch casters.